Performers include: Fred Savage, Jason Hervey, Dan Lauria, Alley Mills, Josh Saviano, Danica McKellar, Olivia d’Abo, Suzy Broad, Michael Tricario, Brandon Crane, Andy Berman, Robert Picardo, Giovanni Ribisi, Scott Nemes, Ben Stein, Krista Murphy, and Daniel Stern (narrator). In the late 1960s, Kevin Arnold (Fred Savage) is a typical American teenager who we see deal with the social and historical events of the era as well as the joys and pains of growing up. 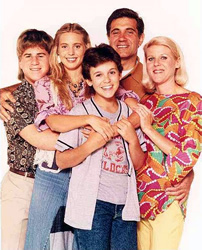 Kevin’s family includes his sullen father Jack (Dan Lauria), stay-at-home mom Norma (Alley Mills), older hippie sister Karen (Olivia d’Abo), and older bullying brother Wayne (Jason Hervey). Kevin’s primary friends are geeky Paul Joshua Pfeiffer (Josh Saviano) and first crush, Gwendolyn “Winnie” Cooper (Danica McKellar). The series is narrated by an adult Kevin (Daniel Stern) as he reflects on his life. Winnie and Kevin take jobs at a Cascades resort. Will their relationship survive as they approach adulthood? What will become of the rest of the Arnold family? How about Paul? Read a detailed description here. There’s been no news of any official plans to revive the series or characters. However, Dan Lauria has mentioned that he would personally like to see the show return with a grown-up Kevin as a father. Each night he would come into the backyard and discuss his challenges with the ghost of his father. • The last episode was directed by veteran sitcom director and British actor Peter Baldwin. An adult Peter Billingsley appears in the episode and was the child star of A Christmas Story, which bears a close resemblance in tone to The Wonder Years. • In an interview on the Just My Show podcast, Dan Lauria noted that the cast and crew found out that the show was being cancelled while they were shooting the second to the last episode. Most of the events that you heard in the final moments were intended to take place in the series’ seventh season. Lauria said that the final episode had been planned from the beginning and they were furious when they found out the show had been cancelled. He contends that the ratings were still high and the show was very popular with advertisers. Lauria said that the finale would have gone something like this: Wayne is doing well running the business. Norma is having success in her job and she and Jack are planning the honeymoon they never had. Their trip is dependent on Kevin being accepted into college. Soon after Kevin is accepted, Kevin, Wayne, and Norma come home to find that Jack has died. • The original script gently indicates that Winnie and Kevin make love in the barn. The network didn’t like even an insinuation of this so Executive Producer Bob Brush left it to the viewers’ imagination. • Recurring and minor characters have been played by notable performers such as Michael Landes, Juliette Lewis, Crystal McKellar (sister of Danica), Robert Picardo, Giovanni Ribisi, David Schwimmer, and Ben Stein. Alley Mills is married to actor Orson Bean who is best known for his role as ” Loren Bray” on Dr. Quinn, Medicine Woman. She appeared on his series but he never appeared on hers. • The series’ theme-song, Joe Cocker’s rendition of The Beatles’ With a Little Help from My Friends, and other classic rock songs are an integral part of The Wonder Years’ six seasons. The expense of securing the rights to use the songs on DVDs is the main reason that Wonder Years official season sets have not been released thus far. The Wonder Years: Why Was the ABC Show Really Cancelled? Hey guys, on http://www.the-wonder-years.com they say the dvd release is scheduled for mid 2014! !